The Lowbrow Tarot is a Majors-only collaborative deck featuring the work of 23 artists (one for each card, including the back design), in lowbrow style (which is also referred to as "pop surrealism"). The Lowbrow Tarot Project showcased 23 amazing artists who used their creative genius and unique style to take on the 22 Major Arcana (plus the card back) and to create 23 new works of art in the rugged glow of the lowbrow art movement that debuted at La Luz De Jesus Gallery, Los Angeles, California, on October 1, 2010. 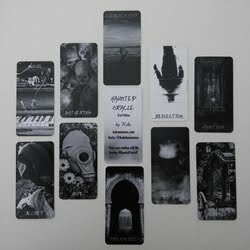 The artists for the deck were chosen out of close to 1,000 submissions. The criteria for the art were that it would need to be an original piece of work, and that it was focused around the card they were given or wanted to complete. So this is not a deck where a tarot card title is slapped haphazardly onto an existing piece of artwork, making it fit. 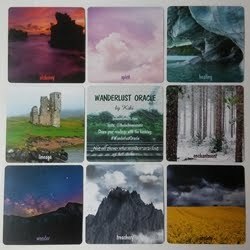 The cards were purposely designed with each tarot card in mind. The cards measure 2 7/8" x 4 1/2". The borders are a lovely plain black. I found the titles difficult to read in many of the cards. The font is very swirly and some of the title colors almost dissolve into the black background. The card stock is sturdy and glossy. The backs are not reversible (look below this review, the last image on the bottom right). The deck is housed in a lovely, sturdy box with a magnetic lid. It's difficult to review a deck where each card is designed by a different artist. I will share with you my thoughts on some of the cards, but I can't touch on every artist and every card. Some of the cards are black and white and some are in color, which makes it an even more interesting mixture. The Hermit is the card that came up for me most during my time with this deck. I have never seen a Hermit card like this one, and I'm very drawn to it. 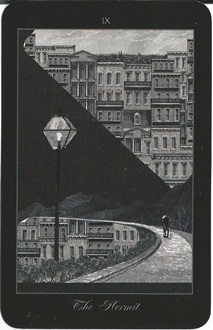 It is one of the black and white cards in the deck, and there is such a strong contrast between the two worlds, the many windows of the apartment buildings, giving the impression of a thousand eyes looking out at you, juxtaposed with the empty blackened area toward which the lone figure walks. This brilliant card was done by Claudia Drake. Two of my favorite cards in the deck are the Sun and Moon. (The Star is great too, making a winning trifecta of the celestial cards.) 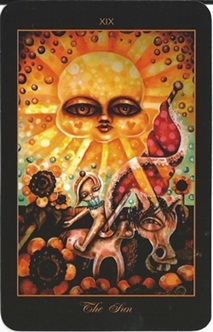 The Sun card (by Angie Mason) is so cheerful in a strange, surreal way that I can't even put my finger on what I love so much about it. And the fact that I can't articulate it is probably a contributing factor in why I do love it so much. The colors are delicious and it just makes me happy, in a bizarre way, to look at it. The Moon (by Jennybird Alcantara) feels so deep to me, so surreal, yet not untouchable. The blues are so inviting, almost hypnotizing, and it makes me want to venture into the card myself to have a look around at all the strange happenings going on. It reminds me a bit of an Alice in Wonderland feel. 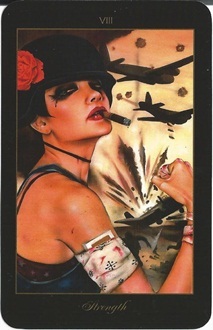 Another beauty is the Strength card (by Brian M. Viveros). It is a very strong visual. The smoking female soldier. The masculine energies of the warplanes, explosions, smoking, cigarettes in the arm band and clenched fist along with the feminine aspects of the female figure, make up, tears and rose-adorned hat make it a very striking and powerful image that is hard to tear your eyes away from. I think the strangest card for me is Judgment (by Scott G. Brooks). There's something about the disproportionate bodies that makes this card a little uncomfortable to me. It's interesting to contemplate, but it gives me a strange feeling. Justice is the one card that I didn't really understand. As it turns out, I was able to read the card by the imagery that related to my inquiry. But taking the card on its own, I don't understand what all the pigs have to do with the archetype of Justice. I wish the book had contained information on the inspiration behind the artwork. It's a pretty card, I just don't get it. In the World card, we get to see the lovely Aunia Kuhn, holding a globe. This card has a classic, vintage feel to it, which I really like. There are a couple of cards that almost disappear into the background of black, which are hard to make out without good lighting (The Hanged Man especially, and The Tower). I don't often read with Majors-only decks, but when I do, I don't find anything lacking. I wondered how a deck of collaborative imagery would read. It actually reads very well. The images aren't too jarringly different from one another as to interrupt the flow of a reading. 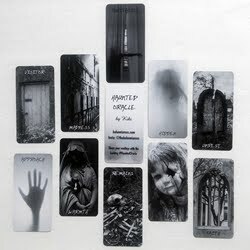 The cards that I have drawn in my readings with this deck have proven to be insightful and applicable to my inquiries. 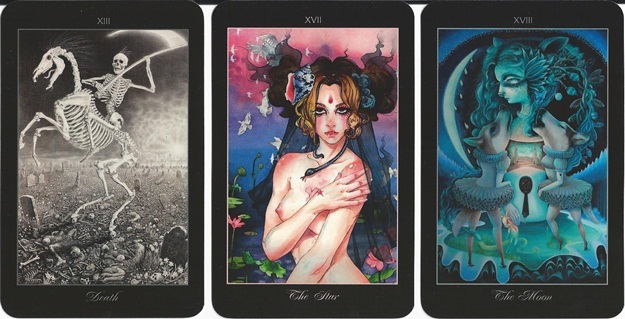 The cards flowed very well together, despite being of different colors (or lack thereof) and artistic styles. I was impressed by the deck and found that it read far better than I thought it would. 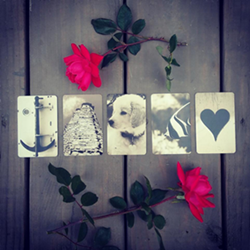 There is a little 56-page book, measuring slightly taller than the cards, that accompanies the deck. Unlike the typical LWB, this one actually has a cover and spine to it, like all Schiffer LWBs. The pages are thick and glossy and in full color. There are two pages devoted to each card. 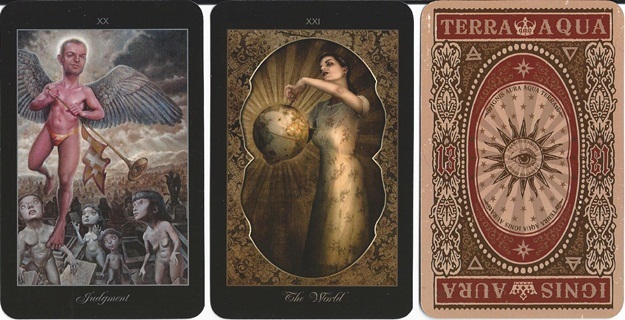 On the left is a full page, full color image of the card, and on the right is a smaller image of the card, along with the artist's name and the meaning of the card, both upright and reversed. 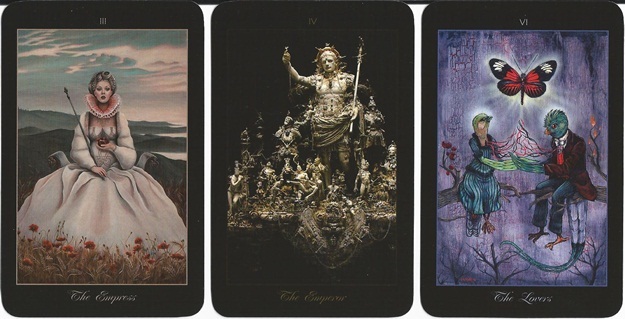 Some of the artists provide their own meanings of the cards, while others are provided for by the author Russell J. Moon. There are no spreads in the book. This is a very interesting deck. I would recommend it as a collector's deck, or for a solid reading deck if you read with Majors only and appreciate the lowbrow style of art. Card Size: 2 7/8" x 4 1/2"
Deck: The Lowbrow Tarot (by Aunia and Russell J. Moon, published by Schiffer). 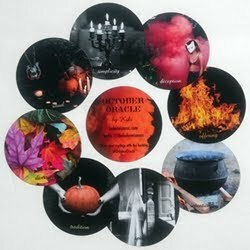 This deck review was originally published on my previous blog (Tarot Dame) on 1/13/13.